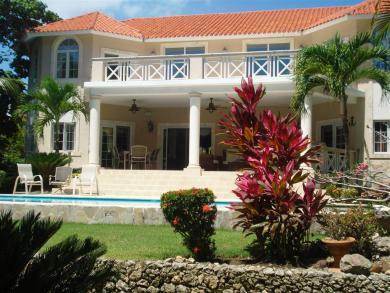 "World-Class Villa in Beach Community"
This classical estate home features over 4,800 square feet of luxurious living space with 4 bedrooms and 4 baths in the main living area plus a maids quarters with an additional bedroom and bath. It is located in a first class community with many attractive amenities, such as tennis, equestrian center and beach club. Built by a well known French Canadian developer every detail has been thought of and included in the design and furnishing of this villa. From the entry portico to the main reception and grand staircase you will quickly feel like you have found paradise. The large living area is very bright with 2 story ceilings and windows and is open to a large formal dining area and terrace. The kitchen is complete with a double door refrigerator/freezer, wine cooler and 5 burner gas cook top. Also on the ground floor is a large bedroom suite with double doors opening directly onto the terrace and topical gardens and additional room that can be used as a study or theater. The beautifully architecture floating staircase leads to the second level with an impressive master suite which opens onto the large upper terrace and includes a walk-in closet, Jacuzzi, and walk-through double shower. The third & fourth bedrooms on the opposite wing complete the upper level. All bedrooms have their own luxurious bath with three of the four bedrooms opening on to one of the several terraces. You will love to entertain in this home with a large terrace, barbecue area and large pool deck. The yard and gardens are very private and spacious. Be sure to add this world-class villa to your must see list!